Trinity University Press, 9781595347688, 240pp. Gerald Stern has been a significant presence and an impassioned and idiosyncratic voice in twentieth and twenty-first-century American poetry. 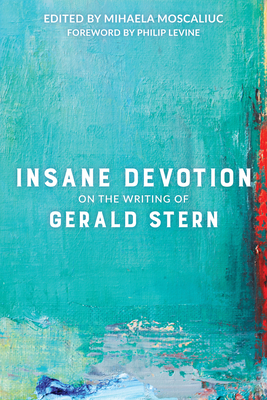 Insane Devotion is a retrospective of his career and features fourteen writers, critics, and poets examining the themes, stylistic traits, and craft of a poet who has shaped and inspired American verse for generations. The essays and interviews in Insane Devotion paint a broad picture of a man made whole by the influence of the written word. They touch on the contentious and nuanced stance of Judaism in the breadth of Stern's work and explore Stern's capacious memory and his use of personal history to illuminate our common humanity. What is revealed is a poet of complexity and heart, often tender, often outraged. As Philip Levine writes in his lyrical foreword to the volume, Stern is both sweet and spiky, "a born teacher who can teach me to see the universe in an acorn and hear the music of the lost in an empty Pepsi can. Mihaela Moscaliuc is the author of the poetry collections Father Dirt and Immigrant Model and the translator of Romanian poet Carmelia Leonte's The Hiss of the Viper. Moscaliuc's essays have appeared in History of the Literary Cultures in East-Central Europe: Junctures and Disjunctures in the 19th and 20th Centuries, Soundings: An Interdisciplinary Journal, Orient and Orientalisms in American Poetry and Poetics, The Task of Un-Masking: Essays on Poetry and Race, and Globalizing Cultures: Theories and Paradigms Revisited. She received her Ph.D. from University of Maryland, her M.F.A. from New England College, and her M.A. from Salisbury University. Moscaliuc is an assistant professor of English at Monmouth University and is on the core faculty of Drew University's MFA Program in Poetry and Poetry in Translation.